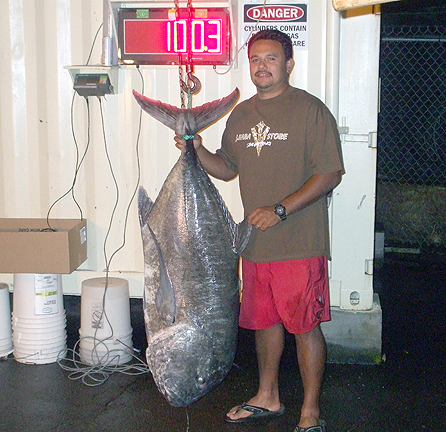 Kyle Saplan was fishing on the Ka'u Coast when he caught his second 100-plus-lb ulua. This 100.3-lb monster hit the bait on Kyle's 12' 6" Hawaiian Gold pole and really put his P454 Newell reel and 80-lb test Berkley Trilene Big Game line to the test. A victorious Kyle and his partner Rocky Sakihara weighed the catch at J. Hara Store.